What Ukrainian cuisine without true homemafe Ukrainian Sausage ! 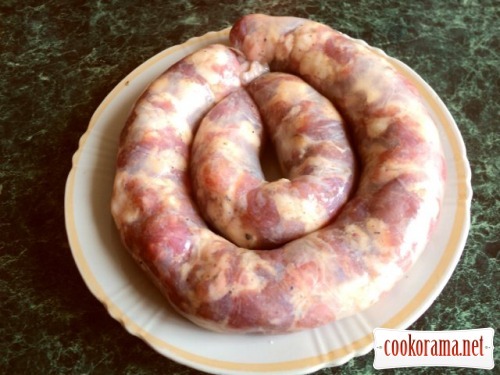 Light Sunday coming — Easter, so I recommend to amuse yourself and your loved ones with delicious homemade sausage, cooked with natural products and without preservatives. Wash sausage, dry with napkin, peel garlic. Dice meat and lard finely. 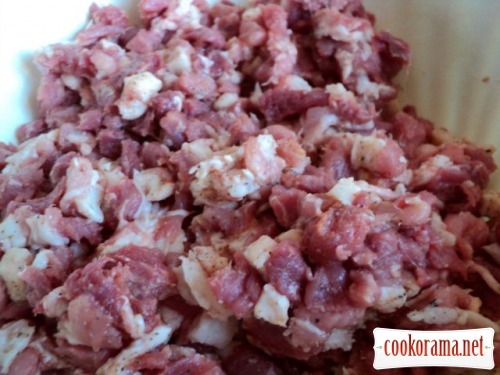 Part of meat you can mince coarsely, but I did not do that. Add in minced meat add, black and red pepper, marjoram, nutmeg, cognac, knead well. 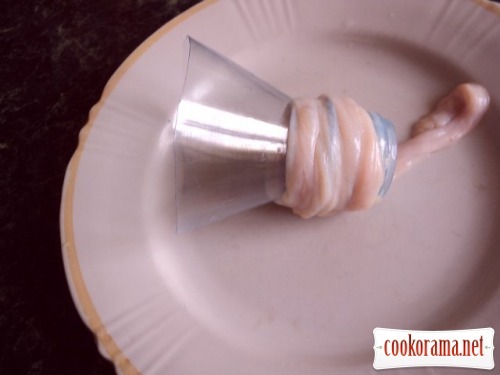 If stuffing turns out dryish add ¼ cup water. Cover bowl with mince with cling film and put for 5-6 hours in the refrigerator for maturing (I left at night). Guts must be cleaned, for which they must be turned out and put for 30 minutes in water, in which add 1/2 tbsp of salt and 1/2 tbsp of soda. Then clean good with blunt side of knife on a wooden board. Rinse and put for 5 minutes in a weak solution of potassium permanganate, to remove pink clolor of guts, then again rinse and lightly salt. You can stuff sausage using a special attachment to the grinder or as I used cropped portion of a plastic bottle as a funnel. Dress gut on it,tie edge with thread. Stuff guts with mince not too tight through the funnel, bind with small rings. 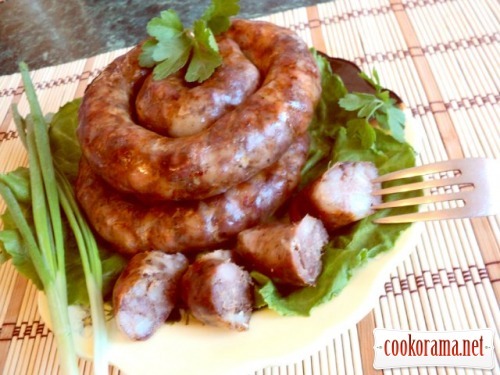 Pierce sausage with thin needle through 5-7cm, for air outlet during cooking and baking. 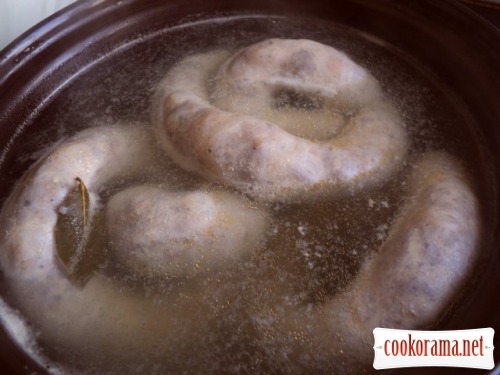 Boil sausage in salted water for 10-15 minutes, add bay leaf. 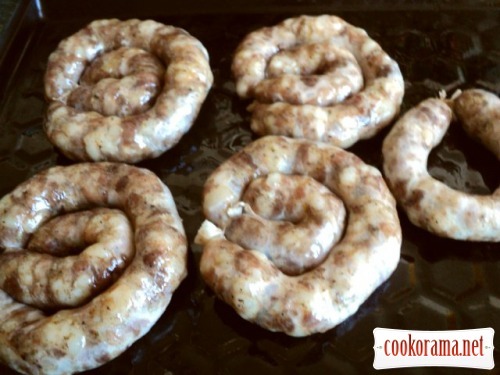 Then remove sausage, drain, grease with oil and put on a baking sheet. At the bottom of the oven set the tray in which pour water, not to dry sausage during the roasting. Bake in the oven at 200 degrees for 25 minutes on one side, then flip, grease with formed fat and bake for another 25 minutes on the other side. 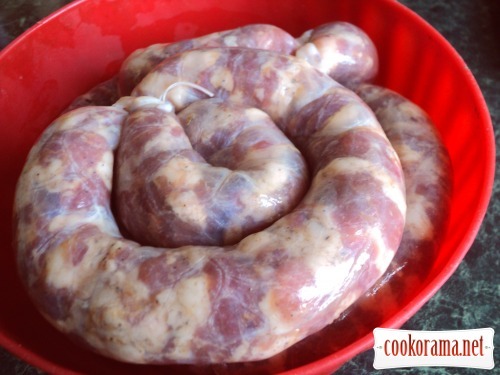 Store finished sausage in the fridge, put in enamel (glass, ceramic) bowl, pouring with lard. 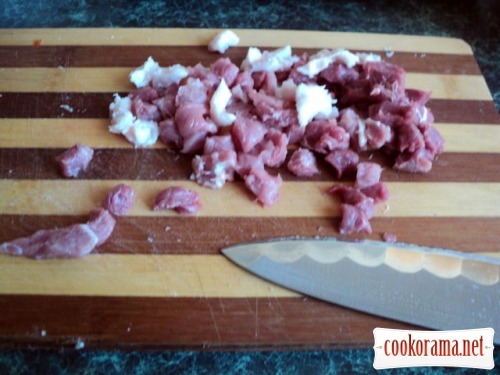 Serve sausage, cut in pieces. Bon Appetite! 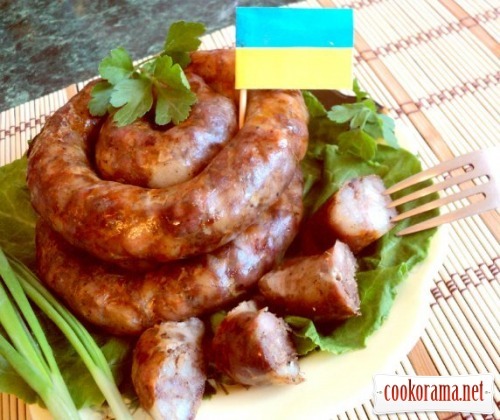 Top of recipe "Ukrainian homemade sausage"
А якже, потихенько починаєм готуватись! Дякую! ооооо.... .ааааа.... сууупперррр!!! смайлик падающий в обморок!!! Спасибо! Колбаска рядом с твоими пампушками смотрятся супер-по-украински! Люда, испробую и твой рецепт на Пасху. Спасибо! Спасибо, Люба! На Пасху- то, что надо! 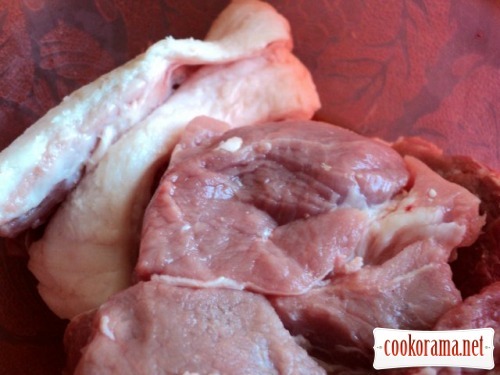 частенько делаю мясную колбасу, всегда сочно, вкусно, сытно, и в отличии от покупной-качественно! Спасибо! От домашней колбаски трудно отказаться, если только ты не вегетарианец! А я помню как мы в детстве готовили такую колбасу с мамой, это было так вкусно! Спасибо Анжелика! … і ще потім зберігали такі ковбаски в баняку зі смальцем! А потім виймаеш, підсмажуєш… ото смакота! Дякую, Леся! а я вот и не понял коньяк 40 г. куда и когда?